Hibernian manager Alan Stubbs has confirmed that a third bid from Rangers for Scott Allan has been rejected. Stubbs also told BBC Scotland that no other club has tabled an offer for the 23-year-old midfielder. "We have had an offer in that it is a little bit more than the initial one if you can call them offers," said Stubbs. "It has been rejected and the club's stance is exactly the same - we won't do any business with Rangers. We have had no other offers from any clubs." Rangers' second bid of £225,000 was turned down by their Championship rivals last month, while Allan, who has a year of his Easter Road deal to run, has handed in a transfer request. Rotherham made an enquiry about the former Dundee United player but the English Championship club's press officer said via Twitter: "[manager] Steve Evans confirms no further interest in Hibs midfielder Scott Allan." Allan, last season's Championship player of the year, has been used as a second-half substitute in the opening two games of the season and scored in last Saturday's League Cup win over Montrose. 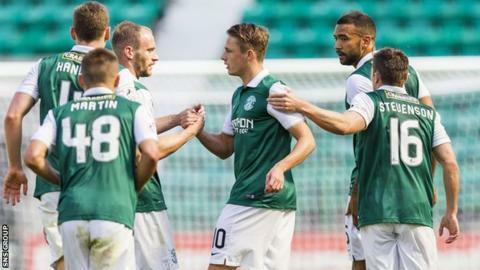 Hibs begin their league campaign away to Dumbarton this weekend and Allan is again included in the squad. On whether or not the midfielder starts the game, Stubbs replied: "It's a decision that is down to me and my staff. "The team is the most important factor. One man can add to a team but doesn't make a team and it will be the team that gets the result."